This pasta is my without hesitation answer to the question “If you could only eat one thing for the rest of your life, what would it be?” I am fully aware of my proclivity to throw the word “favourite” around when describing food but this spicy tomato and arugula pasta really is my ultimate desert island favourite. The first time I tried pasta like this was in Seattle about 6 years ago and I pined and yearned for an exact replica in Ontario, only to find that by constantly fiddling with the recipe I created something that is in my opinion better than the original. 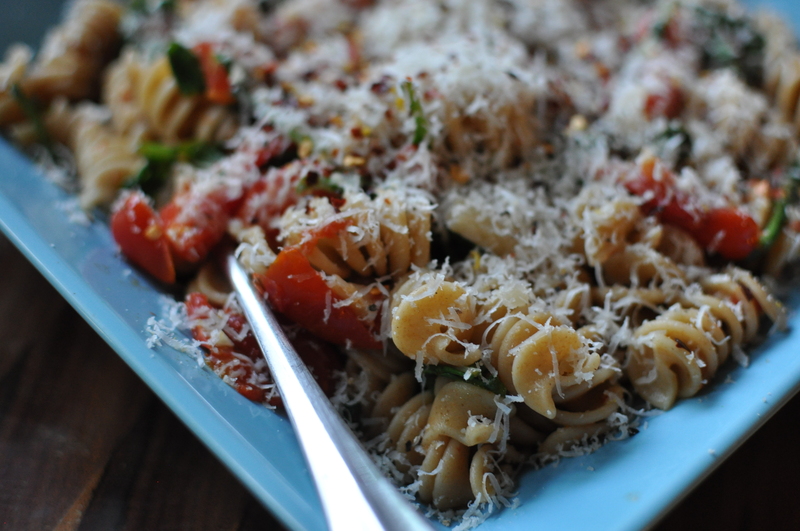 If you’re fortunate enough to have amazing in-season tomatoes that are sun warm and sweet please use them for this recipe, I guarantee they will be happiest nestled amongst the arugula, lemon, chillies, pasta and cheese. I think that the bite of Reggiano really compliments all of these flavours but Pecorino Romano or Pecorino Pepato would also be delicious and slightly creamier options for cheese. It seems the hotter the weather is the more I crave spicy foods and I tend to go overboard with the dried chillies (when I’m cooking for myself I don’t seem to notice just how spicy I make things), the recipe calls for 1/4 teaspoon but I usually will add in a full teaspoon if it’s just going to be me eating it. Ideally, consume outside in the golden evening light with a crisply cutting glass of Prosecco and a stack of new cookbooks from the library. 1. Bring a large pot of water to boil for the pasta, adding the 1 Tbsp. of salt once the water has just begun boiling. Cook pasta according to package instructions. 2.While the pasta is cooking heat the olive oil in a skillet over medium-high heat. Add the garlic and sauté for 30 seconds before adding in the tomato pieces and continue cooking for another 2 minutes, stirring frequently. 3. Stir in the arugula, chilli flakes, lemon juice and zest. As soon as the arugula is wilted turn off the heat while waiting for the pasta to be done if it isn’t already. Add the hot pasta, stock and reserved cooking liquid, stirring to combine. Serve in shallow bowls with copious amounts of cheese, cracked pepper and a sprinkling of salt to taste. I’ve been listening to Wild Nothing a lot lately and this song just shimmers, I think it’s absolutely beautiful. It sounds like the offspring of Deerhunter and Chapterhouse – the prettiest songs by either band, that is.